The Wizarding World of… Southeast Asia? 38th Trial: I wonder so much as to Joseph Conrad’s undeniable skill at detail. I have read ‘Heart of Darkness’, but have began ‘Lord Jim’ as I ironically began a 4-day boat trip through Indonesia, and am even more fascinated with his abilities. And now when I write, how can I describe better the brown of her hair? The sound of the wind and the emotions it stirs? Conrad has become a model of description for me overnight, and can be apart of my blog- as he did learn English while in England! Biggest Success: Began typing up Chapter Six, sailing the islands of Indonesia, climbing Mount Merapi Volcano in Java, and not getting eaten by wild Komodo Dragons as I walked within their reserve. Amidst all my travel, I am lucky to have found time to write and work on my novel! Do I have a blog focused on British influence and literature, and not yet have a post dedicated primarily to Harry Potter? I cannot imagine that to be true, and those who know the far reach of my love for those novels wouldn’t either. So I hope that I am repeating sentiments that have been illustrated before, and swim once more in the imagination of the world of Harry Potter. I am sure I can sit down and analyze the many ties that link that imaginary world to ours, and the powerful political, psychological, and ethical morals inlaid in its own illustration of life and humanity. But instead I wish to save my breath and my effort, because these books speak for themselves. You read Harry Potter, and you know Rowling’s imagination is a reality to her, and the world around us is a magical place. Many people may see my love for these books as juvenile, but it is my love for imagination and its ability for truth, love, courage, and to link endless possibilities to our own potential. I know this, more now in Indonesia than I felt it back in America. Many Europeans have traveled in Southeast Asia, and I imagine Rowling did the same. I see so many things here, settings and people, that remind me of the wizarding world. Southeast Asia can be a playground for the imagination, and I sense the reality of that mystical and magical touch within the reach of my eyesight daily. I marvel at the acute sense an artist has, to look upon the ordinary lifestyle and the monotony of the daily lives of some, and wonder, what if? What if that motorbike can fly? What if I walked through that archway, and disappeared? I have no idea if Rowling did ever come over here, but I appreciate her novels even better now. I have said it before—look around you, there the stories and the inspiration are derived from for any piece of art. But not just in its reality, but in its potential and possibilities. For those who are interested in reading further, here is a small list of the things I have witness and thought Rowling’s eyes must have witnessed too. The Weasley house: its shape is slanted so much to a point that magic must hold it erect. I see houses here stacked impossibly on one another, and the angle of lean makes you wonder at how the splinter and broken walls still have a vertical element. 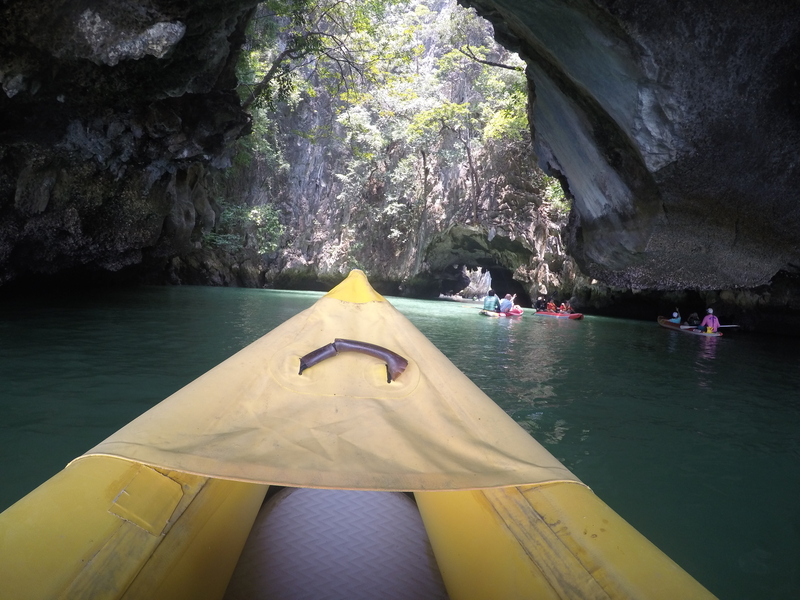 Harry and Dumbledore’s boat trip into the cave in search for a horcrux: In peninsular Thailand we visited many caves, and one cannot help but imagine the stone walls opening to a secret passage with the offer of blood. 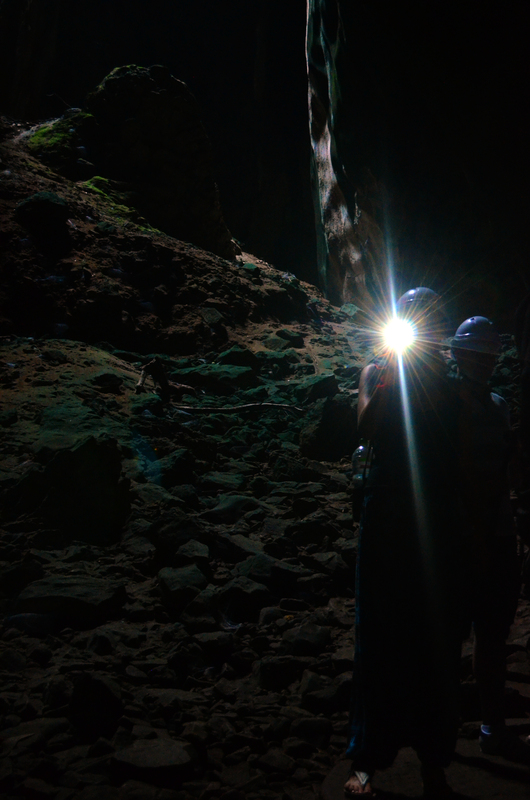 It was in Phang Nga Bay that we canoed through a cave where darkness was disrupted by just one ray of light from our headlamp. 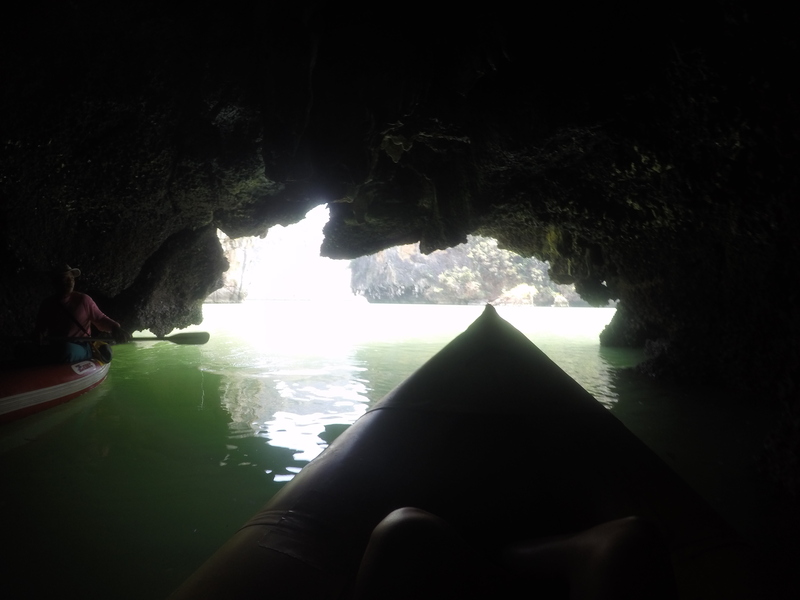 We saw the flowing rock formations and stalactites loom in the background, and no sound came from the black water as the paddle passed through it. A part of me was scared to disturb the water, should a zombie-skeleton hand reach up and grab me. The Veiled Archway: While in Siem Reap, the many Angkor temples give a ghostly lure. More specifically, while at the royal palace of Angkor Thom there was an open doorway that say near the top of the staircase. No stone walls or sandstone sculptures rose beside it, and it looked as eerie and empty as the veiled archway in the Ministry of Magic. As I stared into it, the same whisper seemed to pass with the wind that I hear with most of the temples here—an old wisdom telling of its age and infirmary. The Mirror of Erised: The royal palace in Bangkok, Thailand is, as a friend of mine put it, a jewel box. But within it, we entered a stone building that showcased many ceremonial chairs and decor. Upon exiting, we passed an open room roped off, where nothing but a large mirror stood. It was very tall and wide, surrounded by a frame of engraved metal. It seemed oddly placed, as if there by chance or in changing its location. Maybe being moved deep into the heart of the palace, where nothing short of charming a dog, giving into nature, finding a key, grabbing a drink, passing a knocked out troll, and playing a game of chess would gain you access to see.